The bustling nerve center of the Ilocos Norte province, Laoag is a progressive city that boasts of natural wonders, historic attractions and endless adventures. The South China Sea to its west, the Cordillera Mountains to its east and the neighboring towns to its north and south all contribute to the city’s tourism industry which has boomed in recent years. Laoag is a city of endless possibilities; it has everything that an adventurous traveler wants. The city is governed by the Farinas family, a prominent clan that owns several properties in and around Laoag. The local government has doubled up its efforts in promoting Laoag as a tourist destination and has succeeded in the endeavor. In recent years, Laoag has become on of the most visited cities in the Philippines by both domestic and international tourists. Laoag is home to the only airport in Ilocandia, the Laoag International Airport which serves daily flights from Metro Manila, Hong Kong, Mainland China and Taiwan. The city is about a 50-minute flight from Manila’s Ninoy Aquino International Airport. Land travel is also possible but can take too much time. Depending on traffic, traveling by bus or car can take up to about 10-12 hours. If you’re planning a road trip to Laoag, be prepared make stopovers for meals and bathroom breaks. On the brighter side, land travel allows you to see other places in Luzon along the way. Laoag City is small and most interesting spots within city limits can be explored on foot. Walking along the city streets will give you a different perspective than when you’re on a cab, jeepney or tricycle. It gives you the opportunity to get a better ‘feel’ of the town and linger in places that you find most interesting. The city can also be explored on a calesa (horse-drawn carriage). Hearing the clip-clop of the horse’s hooves drowned out by the voice of your driver animatedly telling you stories about his city is an experience you will not soon forget. Riding a calesa will somehow take you to an earlier time when streets were ruled by horses transporting people and goods. Those who opt for motorized transportation can take the jeepneys or the tricycles that dominate the urban areas. For longer distances, you may arrange for transportation with your hotel or tour provider. 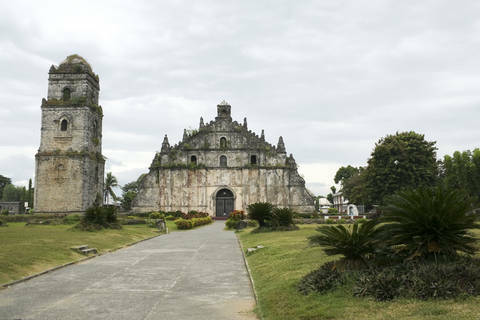 Marvel at the awe-inspiring structure of the Paoay Church. It is a UNESCO World Heritage Site located in the outskirts of the city. The old church’s buttresses were made from sand, limestone, sugarcane juice and the perseverance of the people who built it. It is of the old earthquake baroque design common for old Spanish churches in the region. Dine at Eagle’s Nest Restaurant. If you’d like a taste of authentic Ilocano cuisine, this is one of the best places to go. The restaurant is located at the Java Hotel, about 15 minutes from the airport. You may also choose to stay at the hotel. Sample the Laoag-Batac version of the empanada (stuffed pastry). There has been so much debate on which is better, the Laoag version or the Vigan version and it’s your time to decide. Have a bite or two of this orange-colored pastry stuffed with boiled mung sprouts, shredded green papaya, egg and Ilocos longganisa (sausage). And when you head south to Vigan, don’t forget to try their version as well. Ride the sand dunes of La Paz. Whether it’s on a dune buggy or on a sand board, this is an adventure that’s too exciting to miss. The activity is done on an extensive desert made of coastal sand just outside Laoag. Some of the high points in the desert provide breathtaking views of the South China Sea. Take a photo of yourself beside the Sinking Bell Tower. It is one of the first things you will see when you enter Laoag. It is actually a part of St. William’s Cathedral located 85 meters away. The bell tower is of the same earthquake baroque design as the Paoay Church. Locals say that the tower was built on a sandy foundation which is why it sinks at a rate of one inch per year. See the Bangui Windmills. More than just a tourist attraction, the windmills are actually a source of renewable energy for several towns in Ilocos Norte. The windmills are some of the most photographed landmarks in Ilocos. Swim at the beaches in Pagudpud. If you have the luxury of time, a trip north to Pagudpud will be worth your while. The beaches are stunning, uncrowded and serene. 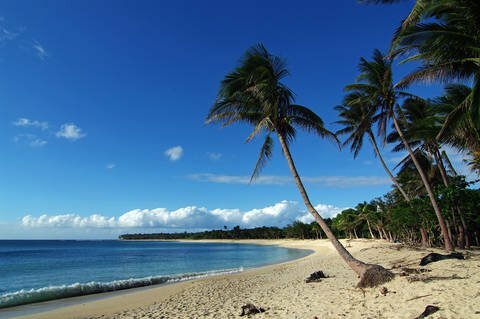 It is regarded as one of the best beaches in the Philippines. Tour Fort Ilocandia. Regarded as the only five-star property in the Ilocos, the resort was once owned by the prominent Marcos clan. The stunning estate faces the South China Sea and features recreational facilities fit for a day trip including a swimming pool, mini zoo and gardens. The people of Laoag are proud of their own brand of hospitality that not only brings comfort but friendship to every guest. Though there are not many resorts or hotels in the city, you can be assured of a nice, safe place to lay your head during your stay. As already mentioned, the Java Hotel is a good choice of accommodations not only because it has an excellent on-site restaurant but also because it offers topnotch services and amenities. Guests enjoy relaxing in an outdoor pool or playing in the tennis courts on its manicured grounds. Java Hotel is located at the city center, close to the Farinas Caltex Station. Hotel Tiffany is another excellent place to stay in the city. The hotel offers affordably-priced accommodations along with basic in-room amenities. It is located minutes from the city center and most tourist attractions are nearby. This hotel is best suited for budget travelers looking for a clean safe place to stay. For those who are willing to splurge on accommodations, Fort Ilocandia offers the best of Ilocano hospitality coupled with modern amenities. The Spanish-inspired resort is of five-star quality, with tastefully-decorated suites, premium beddings, elegant fixtures and state of the art facilities. Laoag is a charming city in the north, beckoning tourists to open its doors and see the wonders of the rest of Ilocos Norte. To say that it is beautiful would be quite an understatement. It is a breathtaking, awe-inspiring historic town and so much more.